(Washington, DC) February 1, 2018 - For the third consecutive year, the Kogod Millenial Index found the greater Washington area to be a very attractive destination for Millennials, but housing costs, traffic and stress make it harder for this generation to view the area as a permanent home. The greater Washington area ranked as the number two most attractive city for Millennials according to the latest research by the Business in the Capital initiative at American University's Kogod School of Business. San Francisco continued to hold the top spot while Seattle and Denver both made big jumps in the 2017 rankings. "The Greater Washington Area continues to be a place where Millennials want to come to earn their stripes. 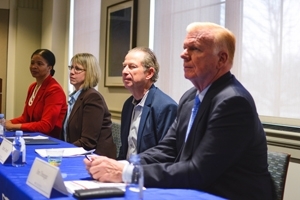 It is critical that this region works hard on regional transportation and housing affordability issues to make sure that young people are able to stay to raise their families," said Jim Dinegar, the new director for Kogod's Center for Business in the Capital. Dinegar was formerly the head of the Greater Washington Board of Trade. Jobs and salaries, the two most important factors for Millennials, kept the Washington area highly attractive with an overall index score of 127%, or 27% more attractive than an average US location. Washington's high proportion of professional jobs propels salaries to 37% above the national average, just slightly below San Francisco and 10% higher than New York's. Despite the region's continued attractiveness, the number of Millennials in the Washington area dropped in 2016, the first net loss in a decade. The 2017 survey shows that over half of area Millennials are planning to move in the next three to five years and only 28% say they love DC and plan to stay forever. Among those planning to move, 67% want a more affordable city, 55% want a place with less traffic and 46% want a less hectic and stressful location. Many Millennials see Washington as an important stepping stone on their career journeys but want to experience other cities or move closer to family before settling down. Only 10% say they are not willing to move out of the area for the right job. High housing costs and snarled traffic continue to be lightning rod issues for Washington area Millennials. Fewer than half of Millennials with household incomes over $150,000 per year feel they can afford to buy a home in the Washington area. Almost two-thirds of Millennials surveyed said traffic was getting worse every year, a side effect of the area's double-digit population growth over the last decade. Washington area commutes are among the longest in the nation, and 60% of area Millennials are driving to work rather than taking public transportation. The research also shows stark contrasts between young, single Millennials who tend to be career- and enjoyment-focused, and Millennial parents who are more concerned about their finances and work/life balance. Almost 60% of Millennials with children say they work hard but can't seem to get ahead. According to Lead Researcher Dawn Leijon, "People have tended to think of Millennials as an alien species with different priorities and frivolous demands. It turns out they were just young and urban, so they were enjoying themselves. As they get older, get married and have kids they look a lot like their parents - they want a nice house with a yard, a reasonable commute and enough money to start saving for retirement. Unfortunately, many of them are having a hard time finding all that in the DC area." Despite high salaries in the region, the report finds widespread financial strain among Washington area Millennials. Half say it's hard to make ends meet even with a good salary and 45% are living paycheck to paycheck. Millennials working with or for the federal government are in slightly better financial shape, but nearly half still say it's too expensive to stay in the Washington area forever. The report advises business leaders who want to attract and retain Millennials to focus on financial incentives, job enrichment and family-friendly policies. Millennials said a higher salary and having a job they enjoy were the two most powerful ways to entice them to stay. Cheaper and more reliable public transportation had the lowest chance of making them stay. The Kogod Millennial Index was calculated using publicly available data and survey responses from 502 greater Washington area Millennials. The annual score assesses the attractiveness of the region as a place for Millennials to live and work and provides a basis for comparison to prior years and other major US cities. The score is an aggregate of five major categories comprised of 33 factors, weighted based on their current importance to Washington area millennials.